Book Review & Giveaway: 'Get Motivated!' By Tamara Lowe. 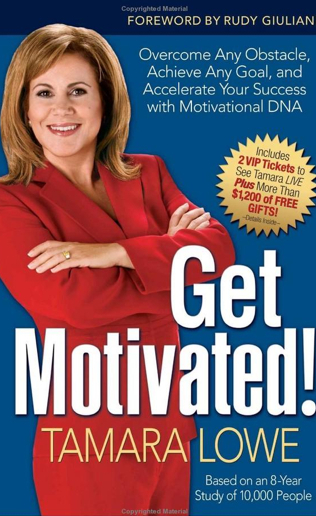 Book Review & Giveaway: ‘Get Motivated!’ By Tamara Lowe. This giveaway has ended.It’s time for another book review and giveaway, and for those of you seeking a little motivation, this one might be for you. Get Motivated! by Tamara Lowe claims to be able to help you Overcome any obstacle, Achieve any goal, and Accelerate your success – and she means it! Working to find your “unique motivational matrix”, the book can help in both your personal and business life by enabling you to see where your motivation comes from and then harnessing it to the best of your ability. While I am not normally one for these types of books, there were some pretty interesting ideas inside that I may be able to apply to my own life. I discovered that I am an “Internal” – people whose main focus is purpose and fulfillment rather than fame and fortune, who are emphatic and animated about the issues they have a passion for, and who can rouse others to contribute to causes they care about. That’s me to a T. And once you find out what kind of person you are, the book gives you some guidance on what kind of motivational DNA you have and what can work best for you. It was actually quite helpful! So…are you intrigued? Want to win a copy? 1. Actually want the book. Don’t enter just because it’s a giveaway; some people might actually really want the book, and I would like to see someone who wants it win a copy. 2. Leave a comment (using a valid email address so I can contact you if you are the winner) on this post, telling me why you think this book could help you. 3. From all legitimate comments, I will use a random number generator to choose the winner. Only one entry allowed per person/email address/IP address, and the winner must be a resident of the U.S.. Book will be shipped via media mail through the USPS. 4. The giveaway ends Sunday morning, September 6 2009 at 7am MST, and the winner will be notified soon thereafter. Good luck to everyone, and if you don’t win, be on the lookout for another giveaway soon!This giveaway has ended. I’m in the process of trying to start a business and could use some of the tips and ideas in this book alot. I’m in a slump, career-wise. Could sure use a kick in the pants. I’m constantly working on overcoming my own laziness. This sounds like a hepful book. I am a hard worker and one who is self-driven, but who encounters frequent burn-out in my career. I need to find a way to achieve balance in my life by feeling a greater sense of motivation for what I do. “Internal” sounds exactly what I am looking for. Would surely like to have some more insights from this book. I took your online test and found I’m a CSI. This is exactly what I need for myself and my team! I’m looking forward to achieving real results with your book. Please enter me! I’d love to read the book! I am in the final stages of publishing a book, and I need some serious motivation for my self-marketing campaign. I’m scared to death of failure because I’ve never done either of these before (write a book or try to market it). A healthy dose of motivation would be exactly what I need right now. I not only want this book, I NEED it! Everything in my life is upside down and needs a ‘swift kick’ to get it going. My house and garage are stacked to the ceiling and I need to be motivated to sell it to aid the financial predicament I am in; I need to lose weight for my health’s sake. I am ‘more than a senior’ with no children and I need to get all of this done and over with. Thanks for your generous offer. I would have entered earlier but couldn’t get around to it. Thank you for your enthusiastic review of my book! Folks can read the first chapter online and take a FREE motivational profile at http://www.getmotivated.com. I’d also be happy to donate an autographed copy for to give away as well! I would love to read this book… I always feel like there is something more, something bigger and better I could be doing, but I don’t know how to break the daily grind to get there. Thanks! I could use something like because while I’m fantastic at coming up with ideas, I could use the motivation to kickstart them. Sounds like a good read. I’ll read it.